Before the news of the closing of St. Anne’s church was announced, the parish was faced with another challenge. Earlier this fall, somebody stole funds from the church’s food pantry donation cash box. 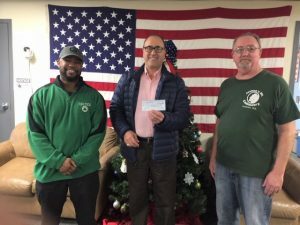 When word reached the Prince Henry Society of Fall River, the Humanitarian and Relief Committee responded with a request to the members for a donation. The members approved a donation which exceeded the amount lost. 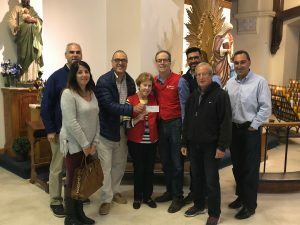 The check was presented on October 13 by committee chairs Joe Borges and Michelle Orlando, Society president Bob Medeiros and other members. To request assistance, please send us a message using our "Contact us" page. You can help the Society continue its good work. Click the link to make a contribution to the cause. 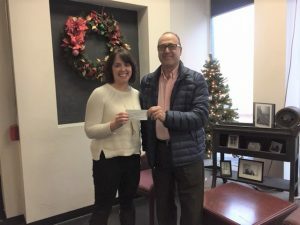 The Prince Henry Society identifies humanitarian needs in Greater Fall River. Designated projects or causes may include, but are not limited to, matters relating to needs of the community associated with traditional Thanksgiving and Christmas programs, disaster relief, and other such efforts appropriate for consideration. A $2,500 budget has been established for the 2012-2013 fiscal year.